Drilling true and correctly dimensioned holes and cutting accurate threads are basic requirements in all engineering work, but as in all areas of engineering new materials and new techniques lead to alterations in standards. Many of these are primarily concerned with production engineering and are well documented, but others affect the quite different the discontinuation of 'number' drills and the phasing out of cycle threads; add the currently book written with the small user in mind is apparent. 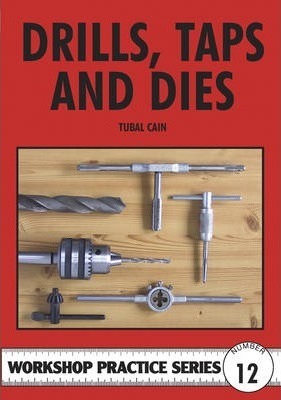 Drills, Taps and Dies not only provides comprehensive tables of all the tools available or likely to be encountered but also explains the differences in various types of drill and thread form and their practical applications. One of the features of the book is a thorough examination of the correct size holes for thread tapping, which in itself could save readers the cost of the book several times over, in the avoidance of broken taps! Twist Drills. Drills of Other kinds. Drill Sharpening. Drill Chucks. Screw Threads. Taps and Dies - General. Hand Taps. Tapping Drills. Screwing Dies. Tap and Die Sharpening. Drilling Forces. Dimensions of BA Tap Shanks. Tables.